The simple solutions to leveling your trailer side to side, and backing into just the right spot really depend on having a spotter outside the car. Not having that separate set of eyes on my solo trip I chose some solutions that are a little more complex. 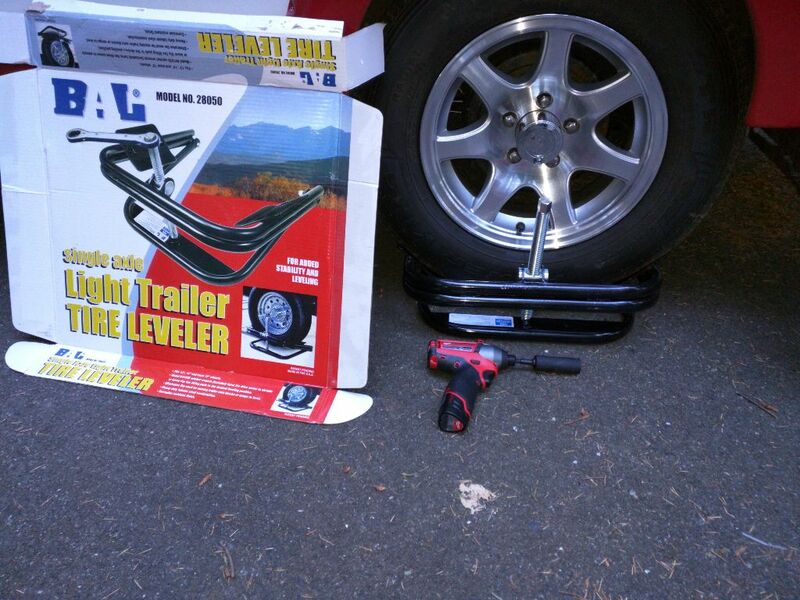 Level and Chocked – A simple solution to leveling your unit side to side is a set of blocks under one wheel. Lay them out, back up onto them, and there you go. You can do this solo, it just means getting out and taking a look a couple of times, and maybe pulling forward and back more than once. I’m sure with practice this would become more efficient. But I ended up with a solution that you use after you park. 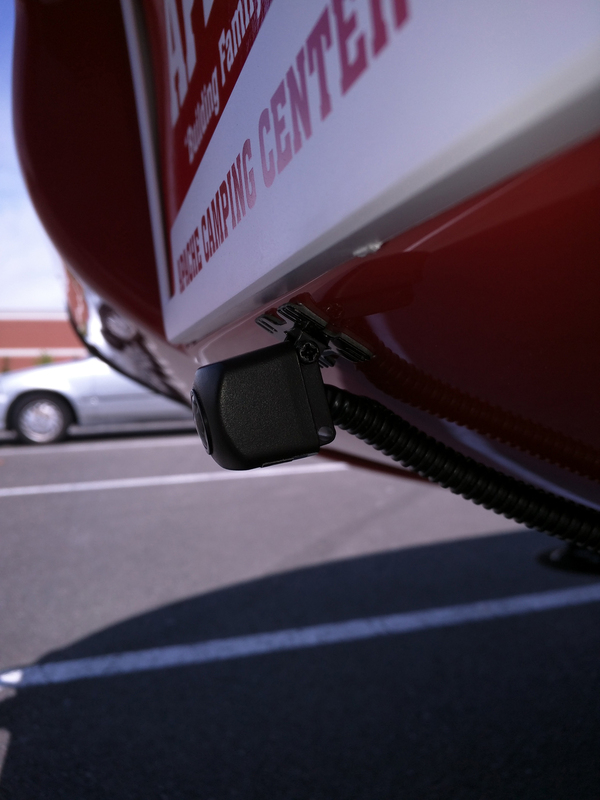 This device slides under the tire and jacks it up, serving as a wheel chock at the same time. Yes, it is big and cumbersome, but it also gives a lot of fine control that you don’t get with blocks. I found that I could tolerate a little side to side slope, especially when I wasn’t bothering to unhook for the night. But when I ended up somewhere with a big slope, or for a couple days, it made cooking and other such tasks much easier with things all level. Looking back – I really wanted to be able to see what was right behind my trailer, so I could back up with confidence. The Jeep’s radio got replaced with a head unit that accepts multiple video inputs, and I had a camera mounted on the rear of the trailer by the license plate. This was so sweet pulling in late at night in pouring rain. I was able to back into a small site in one or two passes without ever getting out of the car. Really a perfect solution for this problem. I do wish the camera wasn’t so wide angle sometimes. I would be nice to use it like a rear view mirror when on the freeway. But cars have to get pretty close before they show up as more than a couple of pixels. On the other hand, wide angle is great for the primary purpose of backing into place. Thanks again Frank, love to read your clever solutions.